Posted by Stacey Paul Barabe on October 5, 2017, updated October 6, 2017. Giant tents littered across oceans of grass all across the world. It is autumn and you find yourself saying Hallo instead of Hello to one another. What is this phenomenon that is just consuming you and millions of others all across the world? What else but Oktoberfest! As you enter these convention sized tents, you are immediately seated at a captivating wooden table and given a front row view at one of the world’s best spectacles. You come in thinking you are about to witness a circus but it’s not the typical elephant riding on a unicycle or lion jumping through rings of fire like you would normal expect to see. Instead it’s a circus of beer and food! You have waiters and waitresses dressed in traditional German clothing like that of the 19th century handing you Das Boot full of ice cold beer. What better way to enjoy the nice cool autumn weather. You are probably wondering why Oktoberfest decided to spell it with a ‘k’ instead of a ‘c’. Well that is actually how you spell October in German, so it literally means October festival. Bet you didn’t think you could read German, congratulations! Here is a little secret most people probably kept from you until now, the majority of Oktoberfest is actually held in September. Started in 1810 as a festival to celebrate the matrimony of King Ludwig I, what started off as a party to give back to the citizens of Bavaria has grown to one of the most popular fall festivals in the world! 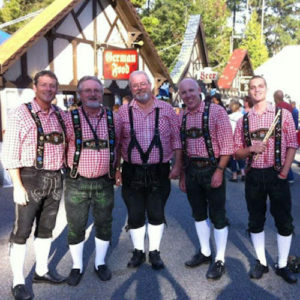 have been headlining German themed events for over 10 years! All that difficult planning and logistical thinking will be taken care of so that this event runs as smooth as possible. So grüß Gott and if this German paradise is a destination that you would like to create, contact us at Exhilarate Events & Marketing and we can make this celebration something that King Ludwig I would be proud of. Exhilarate LLC, is an award-winning events and marketing agency headquartered in Orlando, Florida. Founded in 2008, the Exhilarate team consistently applies creativity, feasibility and engagement as tools to help businesses communicate their ideas, products, and services. With a wealth of experience producing thousands of events over the span on 20 years, we’ve gained ample understanding into what works. Don’t miss out on the latest event news, trends and ideas. Design & Development by Treefrog Cinegraphix, LLC.